Achieving good calf growth rates during prolonged periods of cold weather is challenging because calves will divert energy reserves away from growth to help maintain their body temperature. If extra feed is not supplied to help mitigate this then calf growth rates will be reduced and their susceptibility to illness or bacterial infection will increase. The optimum temperature range for calves, the thermo neutral zone, is typically between 10°C and 20°C. At temperatures within this range, calves will not use any additional energy to maintain body temperature, leaving plenty of energy available for growth. At 10°C and below, calves will suffer from cold stress and use increasing amounts of energy to maintain a constant body temperature. The lower critical temperature (LCT) for a calf will depend on its age. Calves that are less than three weeks old have an LCT of 20°C, compared to calves that are more than three weeks old, which have an LCT of 10°C. 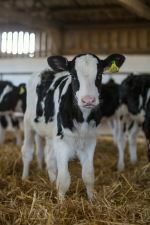 While dry and well bedded housing and calf jackets will help to keep a calf's core body temperature elevated, the most effective way to ensure that they have enough energy reserves to keep warm and maintain strong growth rates, is to provide them with more feed. Feeding additional calf milk replacer (CMR) is essenial in cold weather. A rule of thumb is an extra 10g of CMR for every 1°C drop below the LCT. And increase the CMR feeding rate by changing the concentration, from 15% to 17%, rather than increasing the number of litres fed per day. With the warmer and wetter winter conditions that we have experienced in recent years, calf pneumonia can also be a threat. Calf pneumonia is the second largest cause of calf losses in the dairy industry, with an estimated 40% to 60% of calves affected on farm, depending on the management, strategies and facilities available. So keeping the disease at bay is crucial. Calves can be affected by pneumonia when they're as young as two weeks old, while their immune system is still developing. So it is crucial that they receive enough high-quality colostrum in the first 24 hours. Ensuring good ventilation with high levels of pen hygiene and low stocking densities can all help to reduce infection pressure. For more information on caring for your calves, contact your ForFarmers account manager, or local youngstock specialist.